It seems on my part to be slow on the uptake to have blogged this, given it’s fame, but here we go! And in time for Halloween 2014! 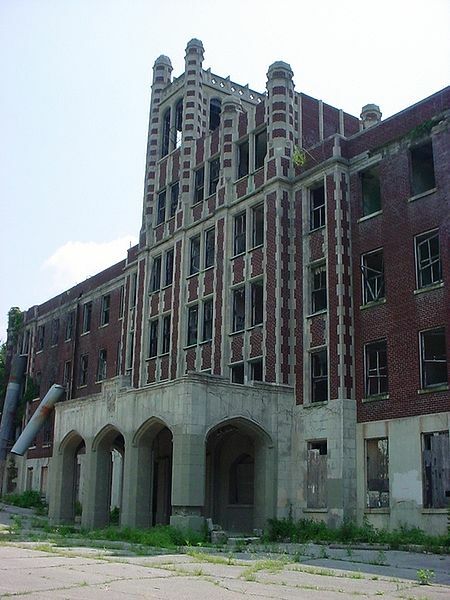 Waverly Hills Sanatorium is now closed unless you pay for a private tour group, opportunities. It resides in the State of Kentucky, USA and opened in 1910 as a two-storey hospital and closed in 1962 when the drug Streptomycin made the TB Sanatorium redundant. The plan for the building is now to turn it into a luxury hotel and funds for its renovation, preservation and conversion are raised via tours, mostly of the paranormal type. I won’t go into details regards the TV shows that have filmed there but they include Ghost Adventures, Ghost Hunters, Most Haunted, Worlds Scariest Places, MTV’s Fear and there is a film called Death Tunnel that was filmed on that location. Ghost Adventures and Ghost Hunters have both done live broadcasts for Halloween specials and the location is popular with those who watch the shows. The land was purchased originally by Major Thomas H Hays in 1883, he opened a small private school there and hired Lizzie Lee Harris as the teacher. She loved Walter Scott’s Waverley novels and called the school Waverley. The name was liked well enough for Hays as he in turn called the property Waverley hills. The name has been changed between Waverly and Waverley Hills throughout its history but the current and likely final variation is the one of Waverly. In the early 20th century Jefferson County (and Louisville) was stricken by the TB outbreak, the response was a two-storey wooden sanatorium that was opened on the land. It wasn’t enough to cope with the high levels of patients and so the building slowly began to take form into the large brick and concrete structure present on the site today. Thousands of people young and old made the place their home for some time and when it finally closed in 1962 the building was already a marked part of the Kentucky history. It soon gained another use, it reopened that year as Woodhaven Geriatric Centre, for the care of those with dementia and mobility limits. It also catered for the mentally ill and unfortunately it closed in 1982 due to the discovery of patient neglect. It was understaffed and overcrowded like so many at this period in time. Due to the inaccuracy of it being labelled a mental asylum there are plenty of urban legends that took form and so it can be summarily advised that caution be given to those seeking information about the paranormal reports. At some point in history there was a situation where the owner wanted the building destroyed but as it was listed (National Historic Register), he would need to ensure that the building was condemned. He actively encouraged vandalism and other acts of destruction on the property. When this failed he eventually gave up and sold the property in 1982. In 1983 it was brought with the idea of changing it into a maximum security prison. It was dropped because of protests from the neighbours and then plans to adapt the place into apartments also fell through from lack of investors. In 1996 the ownership changed to Robert Alberhasky, he wanted to construct the largest status of Jesus in the world along with an arts centre and a worship centre. Plans for this also fell through, to be honest to me this hardly seems surprising, but of over 12 millions dollars required Alberhasky only raised $3000. In 2001 Tina and Charlie Mattingly took on ownership and now run tours to fund the restoration and conversion of the building to a luxury hotel whilst preserving as much of it’s history as possible. Naturally with the history of the place there are an abundance of ghostly tales to keep thrill seekers and ghost hunters attracted to the site. Under the Sanatorium there is a tunnel that has been labelled the “death tunnel”, it was used to allow staff to move up and down into the hospital, the hill it resides on is very high and this was a safer method to get there. The walkways had lights and a later addition to the tunnel was to place air vents along the way. It was also used for the transport of goods, supplies and then removal of the dead. The use of the tunnel for this purpose is why it has the paranormal reputation attached, the tunnel was used to safely transport the dead without the patients seeing them coming down the hill. The tunnel meant that the dead were taken away and it was hoped it would not deteriorate the morale of those in the sanatorium. It seems a practical use, and I have never found any stories about any tragic events down the tunnel to do with someone dying, patients reviving or other such things that might have led to the reason for a haunting. Instead it seems that the legend is purely attached to its use as a removal place for the dead. However I did find that there are reports of people seeing a hearse pull up as if still collecting the dead. The hearse seems to make little sense to me, why would there be a phantom vehicle when there is no sign of this scenario being attributed to any tragic motion other than the natural movement and removal of the dead. Perhaps someone can enlighten me? Presumably either it is collecting or waiting for the next one to be shipped out. Room 502 has a myth attached to it that a nurse died there, she was pregnant from the owner of the time and was unmarried. The tragedy continues in the tale in that she also contracted TB and so probably felt her options were utterly limited. Some say that she was murdered and others that she committed suicide hanging herself by the light-bulb wire outside the room, she now haunts this spot. The first date of this occurrence is listed as 1928 and then again four years later it is said that a nurse either fell of jumped to her death from the balcony of that room. (It is worth noting that so far no names or genuine documents for this have seemingly arrived on my investigations). What is said to be experienced, other than sightings, is a terrible feeling of despair upon entering the room. The death tunnels reputation is also well recorded, you can find numerous accounts of peoples personal experiences along with EVP’s, Orbs and sightings of apparitions. You can find so many of these with an internet search that I haven’t felt a need to present them. Whilst there is not a full list of the deaths, there is a lot of good indications that the lower figure is far more realistic. Death Certificates for the State of Kentucky were recorded and kept, they were maintained by the states and those for 1911-1953 have been made accessible. The rest are likely to be issued in the future and so going by that information and the information gathered by the press, other local sources. There is another claim that the real total (presumably suggesting much higher than 63-64k) had been covered up to keep state funding higher, in reality this would not do a thing, if anything they would exaggerate the numbers to get sympathy and more funding. Another aspect to the speculation on the death count reality is that they say staff were dying so fast no records could be kept. This is not correct at all, for instance the Medical Director Dr Dunning S Wilson was there from 1911-1917 and did not die, he went on to carry on his career elsewhere. He is one of a few examples showing that the facts are not necessarily what go with the stories. Another story is about the little boy who haunts corridors and likes to play by bouncing balls, this invariably leads to folks bringing them along to try and get an interaction. The ghost is said to be that of young Timmy, a six or seven-year-old boy who died there but has not yet moved on – another webister calls him Bobby. Critics say that the ball is not moved by little Timmy but instead a more mundane answer would be that the uneven floors and draughts contribute more to the movement. Timmy is not the only young ghost there, the third floor is also said to be haunted by Mary. Again she is said to play with a ball but the stories are so similar it is entirely possible that like many the stories have simply taken on two entities (excuse the pun). With the children of the Sanatorium needing entertainment it is also said that the swing erected for them can be seem coming and that many have also heard the sounds of children singing ‘Ring a Ring a Roses’. Other reports that seem to be available include a guard seeing a floating head in a room late one night. Having passed out from fright he did not bother to return to the place. Lights have been seen despite there being no electricity and one security guard saw a television on from the third floor where he was outside, he went up to find that there was nothing out of the ordinary. In summary there is a LOT to read and a lot to find out. I hope that you enjoyed the bits that I have put together.